And here we go with the first game in this year’s Spiel des Jahres coverage: Qwixx. Qwixx is a rather light game by Steffen Benndorf, light even by the standards of the non-Kennerspiel award, because Qwixx is a pure dice game. But don’t worry, I’m not talking Yahtzee in a new package here, Qwixx may be light, but it’s a clever little dice game where you actually have to make lots of decisions. And then you still get screwed by the dice, but so does everyone else, and in the end the winner is mostly the player that made the best decisions and got the most out of the bad rolls. Okay, that may be a bit vague, even by my standards of explaining rules, so here’s Qwixx in some more detail. 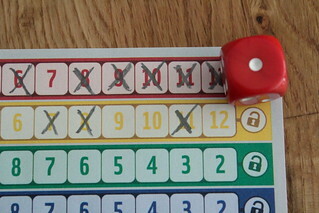 One player rolls a handful of dice, and then all players may mark something on their score sheet. What? No, I tell you, it has nothing to do with Yahtzee! 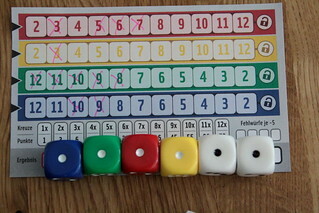 The score sheet only has four rows of numbers to mark, red and yellow counting up from two to twelve, blue and green counting down from twelve to two. Those colours, not by coincidence, match four of the six dice, the remaining two being white. After the active player rolls the dice, he announces the sum of the white dice and all players may mark that number in one of the four rows. The active player may, in addition to that, mark the sum of one of the white dice plus one of the coloured dice in the row of that colour. If the other players don’t want to mark anything, there’s nothing to force them, but if the active player won’t or can’t use either of his options, he must mark a failed roll that will cost him five points at the end of the game. Keeping you from patiently and slowly marking all the boxes for an astronomic score is the fact that, sooner or later, the game will end. After a player marks five boxes in one row he may mark the last one (two or twelve, depending on colour) and with that close the row. No player may mark anything in that row any more, so closing rows where you score the most points is the safest way to win the game. Closing rows is also one of the ways to end the game: as soon as the second row is closed, the game ends immediately and you add up your scores, start crying and cursing and congratulate the winner. Alternatively, as soon as a player has to mark their fourth failed roll, the game also end with the same psychological trauma. Ending the game is my biggest criticism on Qwixx, because it’s an excruciatingly slow process in most games. Twos and twelves are the rarest numbers with two dice, as pretty much everyone knows, and way to many games end with a slow and painful wait for someone to mark their final fail because no one manages to complete a row. And that’s a shame, because up to that slow ending I enjoy Qwixx. For a game this simple, it offers a nice amount of risk-management, some strategic options – mark as much as you can before the game ends, or go slowly and hope to mark more – and the tense decision every turn whether marking a number fits your strategy. And it keeps all players involved at all times, a big plus even in a quick game. Not to forget the opportunity to swear shamelessly when the next roll shows exactly the number you just skipped, something that happens much more often that your statistics teacher would believe. In the end, I do like Qwixx, but due to its extreme lightness and the slow ending I don’t think I Spiel-des-Jahres-like it.